Some of you may be getting ready to brave the elements for the Winter Solstice Ride. Maybe at other times, it’s just about biking to work on a frosty Canterbury morning. Whatever the situation, if you spend long enough riding around Christchurch then at some point you will have to deal with keeping warm on a cold day. So what are some options to consider? Keeping warm when biking tends to be all about layers. You need layers to keep in the heat, layers to keep out the wind, and sometimes also layers to keep out the rain or snow (we dealt with cycling in the wet in a previous post). On a cold day, there’s nothing like a thermal underlayer (wool/merino or polyprop) to keep the body toasty even when everything else is feeling the cold; a vest at least and you may want to consider leggings as well. And if the wind-chill factor is cranking up, then a solid outer layer will be a godsend; for example my Columbia Interchange jacket keeps me nice and warm up top, while my overtrousers can keep the heat in down below. It’s an interesting conundrum that, often when biking, one can be quite warm inside (due to the exertion) while the extremities are cold (due to the air temperature). It may be that, initially, your body feels just right all rugged up but, as you keep biking, you get too warm. This is where layers come in handy again, because you can of course peel off an initial outer layer once your body needs a bit of bracing air to balance the internal heating. Or at the very least have something you can roll up the sleeves/leggings on, or open some venting (many cycling-specific jackets are quite good for extra cooling vents). It’s important to keep the head warm on a cold day. Bike helmets might sometimes feel hot and stuffy on a warm day, but that usually doesn’t make them particularly insulating on a cold one. Better to get yourself a thin cap that you can slip underneath your helmet to cover your head and ears – Ground Effect’s Baked Beanie is a good old favourite. If you have a jacket with a thin hood, even just putting this over your head might protect you sufficiently from the elements. Or if you have a favourite thick beanie, you could just ease out your helmet straps a smidgeon so that you can wear it underneath. Hands and fingers are also pretty important to keep warm while riding – it’s hard to do coordinated things like steering, changing gears and braking when you can’t feel your digits. Sometimes a thin pair of gloves might be sufficient to ward off the chill. But other times you might want to apply the “layer” approach again, with a warm layer inside and a windproof/waterproof layer outside. This could be dual-layered gear like ski gloves, or simply popping some thinner gloves inside some shell gauntlets – at The Warehouse this combo of cotton gloves and leather gloves might even do the trick for under $4. Just make sure that you can do all the fiddly things you need to do on a bike (like changing gear levers) when you’ve got big bulky gloves on. Don’t forget your feet too; the cold can sneak into your toes too if you’re not careful. Hunt down some good thermal socks, or consider putting on a double layer of ordinary socks. Pay attention to how well your gear keeps you warm around the neck and throat area; a cold wind can play havoc on your larynx. Does your jacket have a high collar that you can zip right up? Maybe you might want to consider a scarf for some extra protection. A really nifty item that I picked up a few years ago was a Polo Pancho, a Kiwi-invented clothing accessory. It’s a bit difficult to describe exactly what this is; suffice to say that it’s a clever piece of polar fleece that can be a neck/chest warmer, a balaclava, a beanie, a scarf… All I know is that it is one of the better $20 investments I’ve made, and I’m very grateful for it on a frosty day! Handy hint: before you head out on a chilly day, see if you can’t “pre-heat” your external gear beforehand near a heater or fire – this helps keep you warm for longer before the cold starts to sneak in. Be careful of any fire danger though! 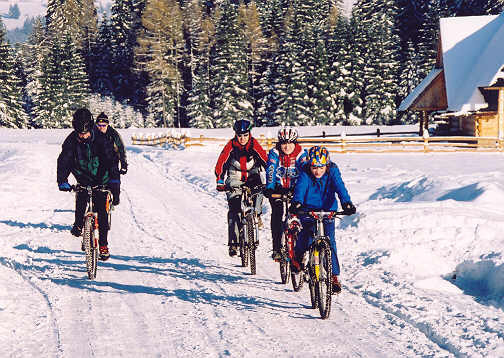 Ultimately, keeping warm when biking is similar to keeping warm during other outdoor pursuits, such as tramping and skiing. In fact, chances are, if you have good gear for those kinds of activities, then they’ll probably do the trick for cycling as well. What is your best tip for keeping warm when riding on a cold day? Three pairs of gloves – my circulation isn’t the best. 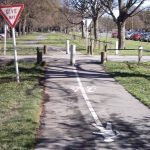 Previous Previous post: Should Cycling be allowed in the Botanic Gardens?